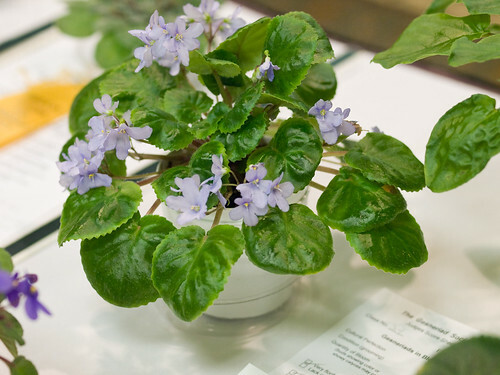 At the Mid Atlantic African Violet Society (MAAVS) convention in Fredericksburg a few years ago, I obtained two leaves each of these miniature African Violets and have found that they fit in with every growing scene: terrarium, dish garden, on the light stand. 'Teeny Bopper' has very tiny (about Sinningia pusilla-sized) dark green, glossy leaves and purple cup-shaped flowers in profuse clusters held above the foliage. 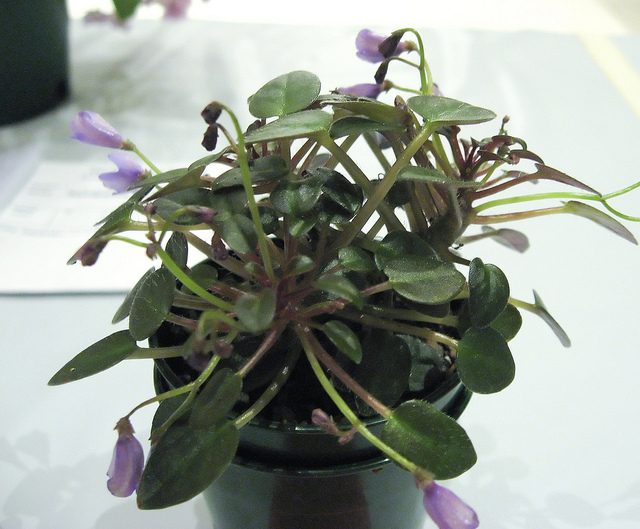 A small specimen of 'Teeny Bopper' exhibited at the National Capital Area Chapter show in 2006. This is a truly diminutive plant. S. shumensis has larger (but it's still a mini) medium green leaves with white, single flowers that also stand above the foliage. Saintpaulia shumensis cl shumensis Mather EE, exhibited by Nancy Carr at The Gesneriad Society's 2009 Convention. plastic covered containers fron the salad bar and put that at the end of the lights, approximately 8" top of container to the bottom of the tubes (two 40 watt daylight). garden, or just in pots. The humidity ranges from 100% (terrarium) to 65-70% for the others. When I transplanted these African Violets, I used ProMix with some added horticultural charcoal. The mix is kept moist and I rotate fertilizers at 1/4 strength every second or third watering except for the terrarium where I use an eyedropper of fertilizer every two or three months so as not to overwet the plants. If you are fastidious about removing suckers, you'll have your work cut out for you because these plants invented the word! However, if you let them produce suckers, you'll quickly have nice mounds of blooming plants. You might have to remove one or two, but for the most part, the plants will produce suckers symmetrically around themselves.